BoneKEy Reports, published by the International Bone & Mineral Society, is an online journal providing coverage of the field of bone and mineral metabolism. BoneKEy Reports publishes review articles as well as highlights of the best and latest research from across the bone field. This journal has now been triggered from the CLOCKSS Archive. In keeping with its unique mandate, CLOCKSS is proud to offer continuing and public access to all available years of the BoneKEy Reports journal. 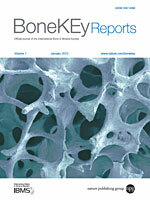 BoneKEy Reports content is copyright International Bone & Mineral Society and licensed under a Creative Commons Attribution-Noncommercial-No Derivative Works 3.0 United States License.